For many years I made wheel thrown domestic ceramics and a small amount of handbuilt work. I now only make slab built work. My black and white work reflects several areas of interest – West African adobe architecture and architectural details, working with black clay, making boxes and experimenting with surface textures. Several years ago I saw an exhibition by photographer James Morris of West African adobe architecture and was fascinated. This was the original source of inspiration for me. The forms I make are not directly taken from the buildings but are visual ideas which surface when I start the ‘making process’. I incorporate details into my work from windows, grilles, surface textures and the supporting timbers which protrude from buildings. 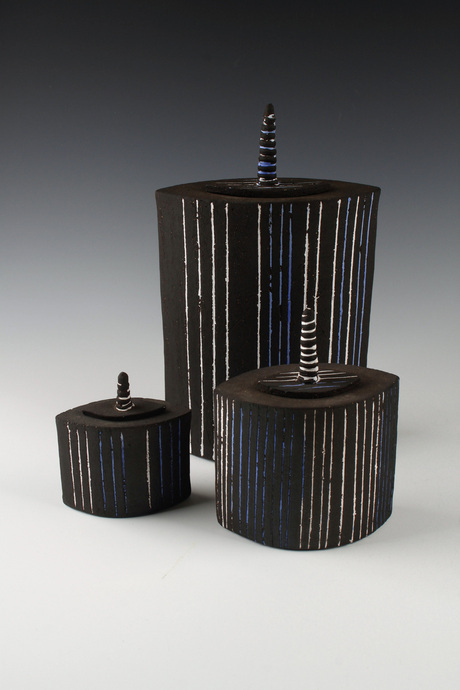 Black stoneware clay with white matt glaze and textured handbuilding clay with matt cobalt glaze or cobalt/copper washes over a matt white glaze. .Also decorative porcelain spoons. Fired to 1260 in an electric kiln. I’m currently exploring lower firing temperatures.